Lots of athletes dream of sinking the game-winning shot, scoring the game-winning touchdown, or getting the game-winning hit. It’s easy to be enamored with the romantic idea of being the hero. But that doesn’t happen by accident. It takes a lot of practice and preparation to put yourself in the position to perform well in a pressure situation (heck, it takes a lot of practice and preparation to perform well in normal game conditions). That means, if you’re a basketball player with a desire to excel, you should be practicing ball-handling and shooting, or doing something to improve your strength, speed, agility, and athleticism… EVERY DAY! And that, I think, is where there is a disconnect. It’s one thing to express a desire to play well. Anyone can do that… that’s just talk. It’s quite another to do what’s necessary to play well. That takes time and effort and commitment and dedication and focus and purpose and motivation and persistence and perseverance and… well, I think you get the point. And, while this all may seem somewhat overwhelming, it doesn’t take a 24/7/365 commitment. Focus on the quality and consistency of your efforts, and not necessarily the quantity. If you’ve got 10-15 minutes to practice your ball-handling, make it purposeful and give it the best 10-15 minutes you’ve got. Know and understand your areas for improvement and direct your efforts, accordingly. Don’t make the mistake of thinking that, since you only have limited time, improving your physical or sport-specific skills is not worth the effort. 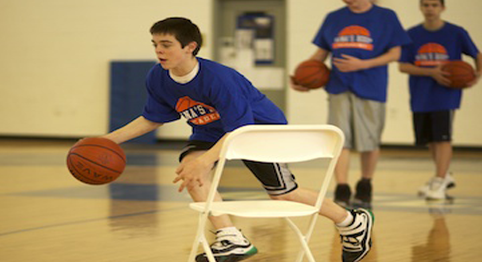 Trust me, the cumulative effect of quality repetition will steadily improve your game. Devote yourself, daily, to self-improvement. Make it happen.